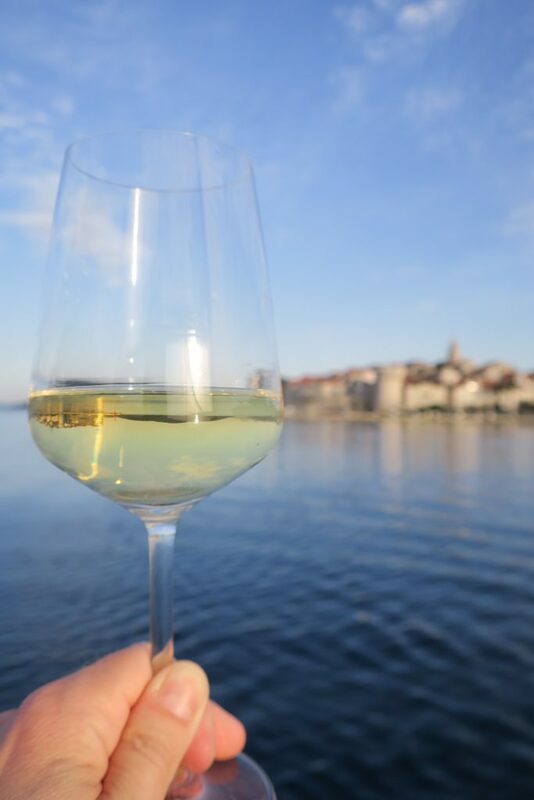 I sat on the balcony of a hillside winery overlooking a pocket-sized Adriatic harbor in Croatia, concerned for a moment that the extravagant beauty of the setting had clouded my judgment of the wine. But another sip confirmed what I already suspected: One of the world’s great grape varieties was one that almost nobody even knew existed. After I got home, I looked up Pošip (pronounced “POH-ship”) in my trusty Oxford Companion to Wine. That massive book devotes just one sentence fragment to the grape: “Pošip, impressive southern Croatian white wine grape probably originating on the island of Korčula.” That’s it. The World Atlas of Wine writes but a single word about the grape, calling it “promising.” Well, Pošip’s promise has been kept. If you like dry white wine, you’ll almost certainly like one version of Pošip or another. The Pošips I tasted ranged from juicy, Sauvignon Blanc-like wines to forceful and mineral Chablis-style bottlings to rich, polished, focused examples that reminded me of top-quality wines from the Côte d’Or. The worst Pošips I tried were merely good. The best were extraordinary. I first tried Pošip at Diocletian’s Wine House, set behind three massive ancient Roman stone arches in the city of Split. This stylish wine bar and restaurant positively oozes sense-of-place. Its staff could not have been more welcoming, though (full disclosure) I did alert them that I was a wine blogger when I made my reservation. What I thought would be a one-hour tasting with the sommelier turned into a three-hour extravaganza, full of gorgeous wines complemented by platters of savory local cheeses and charcuterie. Almost all Pošip is still, but my first taste of the grape was an unusual Degarra “Primo” sparkling Pošip from Zadar, made in the traditional method, including 1.5 years of aging on the lees. It smelled expensive, with notes of baguette, citrus and white flowers, and it felt very classy, with tiny, foamy bubbles, tight acids and a touch of minerality. I also sampled Degarra’s still Pošip, the new 2017 release, which had a wonderful combination of citrus and chalky minerals. The organic 2017 Rizman Pošip, aged in stainless steel, had an attractive aroma of lime and passion fruit, and it too had that delightful combination of juiciness and minerality. Bright and brilliant. The Pošips aged in steel as opposed to oak all exhibited that flavor combination, with variations. The refined Krajančić “Intrada” Pošip felt citrusy and saline, the Čara Winery “Marko Polo” Pošip had big lemon-lime acids and a sweetly chalky finish, the focused Toreta Pošip had excellent balance and a note of bay leaf mixed in with the lemon and pear notes, and the Skaramuča Pošip offered plush apple flavor with grapefruity acids, a perk of spice and a dry, mineral finish. These are refreshing, sunny wines that have no shortage of elegance. But it was the Pošips with a little oak on them that really stole my heart. The 2016 Rizman “Nonno” barrique-aged Pošip was the first to blow my mind. It smelled of buttered popcorn and Meyer lemon, and it was at once big, bold and classy. The wine was gorgeously rich but very focused, with butter, fruit, spice and refined acids in all the right proportions. Korta Katarina’s 2016 Pošip blends wine aged in stainless steel and oak, resulting in a spicy, zesty wine leavened with a touch of cream and a finish of stone. Both of those wines left me feeling thoroughly seduced by Pošip. Where I fell truly, irrevocably in love with Pošip was on that balcony overlooking the Adriatic, sitting at a table with winemaker Luka Krajančić (pronounced KRAH-yahn-chich). We were in the village of Zavalatica on the island of Korčula, the birthplace of Pošip. By that point I had already fallen in love with the island, which has a spine of weathered limestone mountains rising from green slopes plunging into the sea. Red-roofed hill towns poke up in places, surrounded by stone-walled fields and ancient stone terraces, some abandoned, some supporting struggling olive trees and grape vines. The Krajančić “Sur Lie” Pošip comes from 55-year-old vines, which have much greater potential than young Pošip vines, Krajančić explained. “The energy of this wine is different,” he went on, “because we harvest this in August — very early — it’s still summer, we’re smiling, there are tourists, and we’re happy when we make it.” I certainly felt happy when I drank it. The aroma reminded me of an expensive white Burgundy, with notes of spice and butter. And what grace on the palate! Fresh butter, honeycrisp apples, refined acids, minerals on the finish… and through it all, a shaft of spice like a laser beam. Yes. A thousand times yes. The 2015 “Statut” Pošip had an aroma reminiscent of kettle corn. Its ripe apple fruit almost dropped off, but some spice caught the baton before it fell, followed by a touch of wood on the finish. But the 2016 “Statut” was completely different, with an aroma of candied herbs. It tasted almost heavy, with honeyed fruit and sweet chalk balanced by spice. 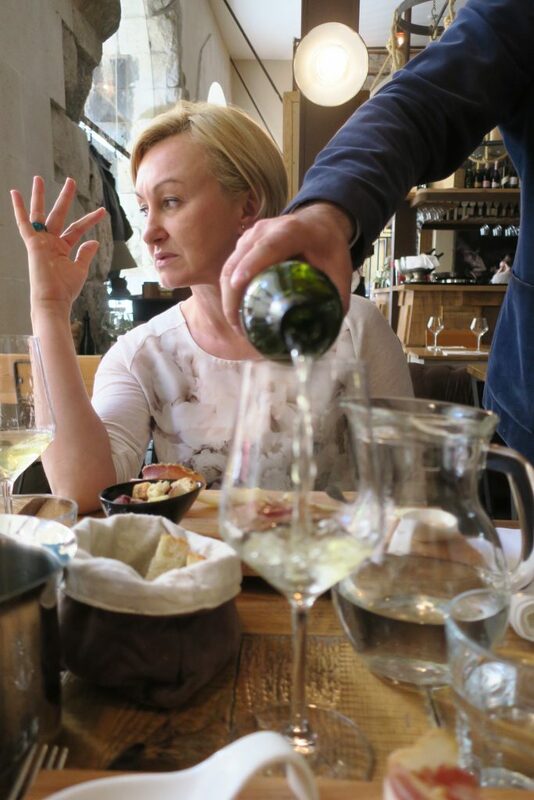 “This wine is different, because it made the decision that the alcoholic fermentation was not going to end,” Krajančić explained. He had set out platters of cheese and fresh, sweet prawns, and the Pošips stood up to both with ease. I mentioned this fact, and Krajančić responded, “There’s a mystification around finding the perfect wine pairing for food. The best combination is the best company. 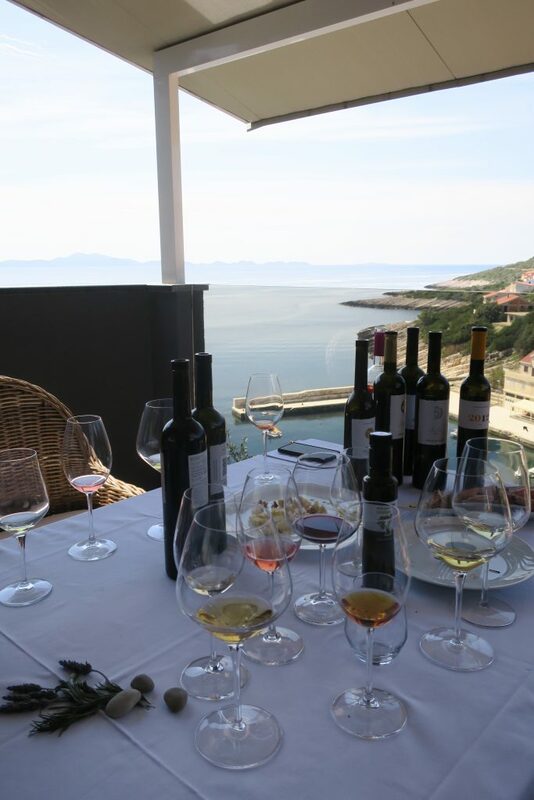 It tastes better when you have good company.” I won’t disagree, but having beautiful food on a beautiful sea-view balcony certainly didn’t hurt the experience of the wine. Pošip does have one huge problem, which is that it can’t be produced in great quantity. The island of Korčula is steep and rocky, and most of its vineyards must be worked by hand (the same is true or many vineyards along Croatia’s coast). Most wineries are boutique, family affairs, with relatively small production. There isn’t much demand for Pošip in the United States, but there isn’t much supply, either. That fact makes travel to Croatia that much more rewarding. That fact also got me thinking. Zinfandel was born in Croatia, and California produces some absolutely delicious wines from that grape. 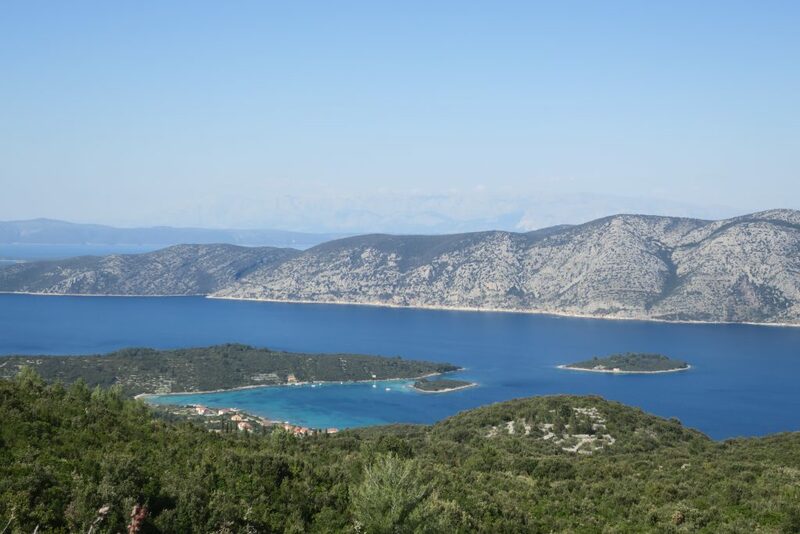 I wonder how Pošip would fare if it were grown somewhere other than its stupendously gorgeous island home? I suspect it will be some time before I know the answer to that question, if ever. For now, I’m left with the couple of bottles I brought home with me, and the hope that I’ll return soon to Korčula. 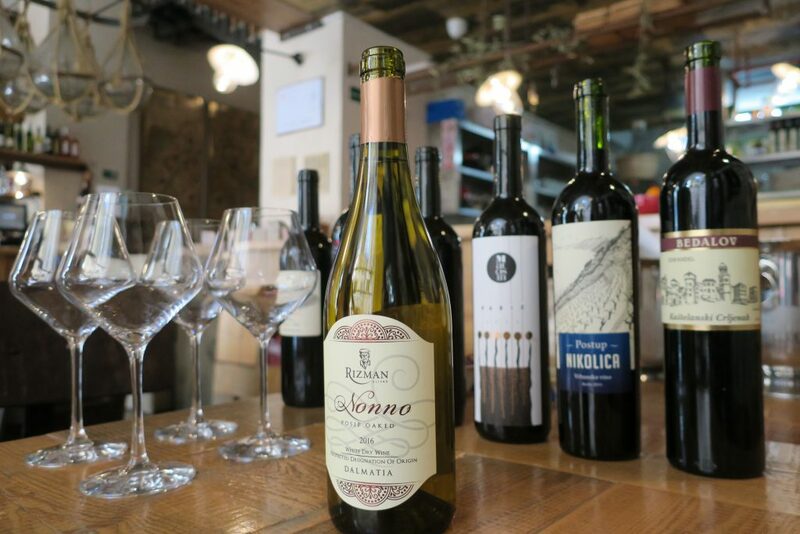 Have you seen any of these wines in Chicago yet? Hi Joy – Unfortunately I haven’t. I’ve seen a Croatian Syrah, and a Graševina, and one or two others, but no Pošip, unfortunately.